This picture belongs to Georg Braun and Frans Hogenberg’s book Civitates Orbis Terrarum. Frans Hogenberg was an important engraver and painter. He is very famous because of his pictures which showed the war events of the 16th century. In addition, he made cartographic projects in collaboration with Georg Braun, an important geographer. They worked together making maps of cities around the world. 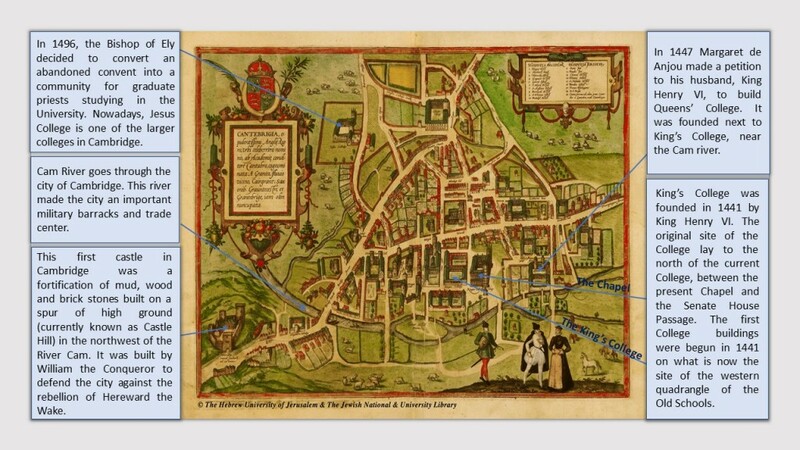 This picture shows the city of Cambridge in the 16th century. Cambridge became famous for being home of one of the most prestigious universities in the world. It is a large town and its town planning is irregular. It is a non-metropolitan district of the United Kingdom, a very old English university town and the capital of the country of Cambridgeshire, on the banks of the River Cam. It is located approximately eighty kilometers from London and is surrounded by several towns and villages. Cambridge has only 108.000 inhabitants, most of them students who come from other countries around the world. We can appreciate two main streets. One of the streets goes through the middle of the city and is parallel to Cam river. The other one is diagonal, and it stretches from Trinity Church to Cambridge Castle. The center of the city is between Cam river and the horizontal main street. This engraving represents some activities that were carried out at that time, mainly representing the primary sector. For example, there is a man fishing in the river and at the top of the picture we can appreciate some cattle farming, specifically sheep. In the center of the picture it is possible to see the most important buildings and colleges that make up the University of Cambridge such as Queen’s College and Trinity College, as well as the best known King’s College. It was founded in 1441 by King Henry VI and munificently endowed. The original site of the College lay to the north of the current College, between the present Chapel and the Senate House Passage, next to river Cam. In 1443 King Henry began to buy up the site of the present Front Court and Back Lawn, two important courtyards of the King’s College. This was a built-up part of the town with shops, houses, several university hostels, and the original site of Godshouse (now Christ’s College). He had always meant the College to be built south of the Chapel, but this was prevented by shortage of money and the Wars of the Roses. 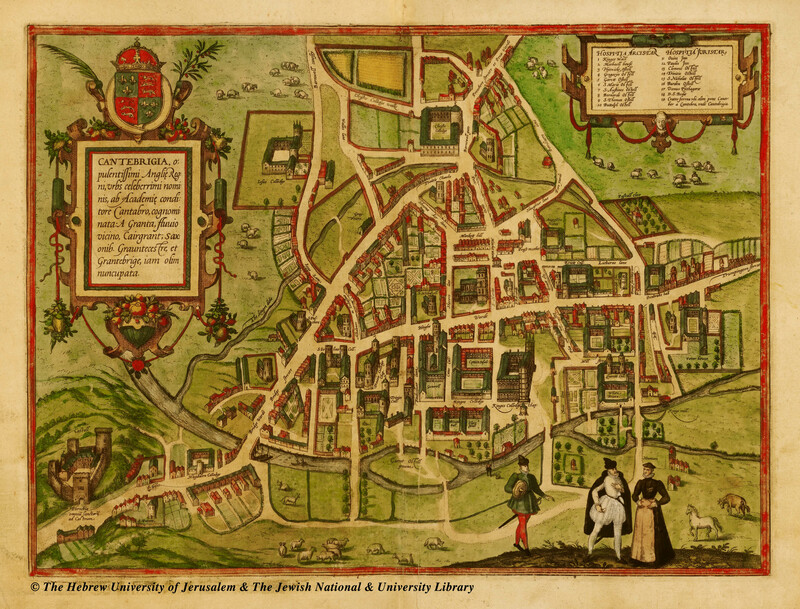 On the top left of the picture there is another scholar institution, entitled Jesus College. For 300 years, between 1560 and 1860, Jesus College was primarily a training college for Church of England clergy. It was strengthened in 1671 by a major gift from Tobias Rustat. Until the 17th century there were other students, but they rarely stayed long enough to get a degree, a qualification which was essential only for clergymen, schoolmasters, and church lawyers. On the right side, we can observe Cambridge Castle. It was built by William I in 1608 concurrently with nearby Huntingdon Castle to anchor Norman rule against the rebellion of Hereward the Wake. This first castle at Cambridge was a timber fortification built on a spur of high ground. As a remarkable fact, in the 16th century, the only part of the castle still standing was the gatehouse, which was utilized as the county jail. Unfortunately, in the 18th century the gatehouse was demolished and nowadays, instead of the Castle, there is a higher ground called Cambridge Hill. Crossing the city, is the Cam river. It is curious to note that the name of Cambridge is actually a pun. Cam refers to the river which go through the city and Bridge refers to the 32 bridges that this river has over it. There are a lot of famous bridges and each one has its own history. For example, the Coe Fen bridge is also called the Sheep’s Green Bridge because it was very useful for shepherding. Clare College’s Bridge is a bridge which was built in the 19th century to better defend the city. This entry was tagged Cambridge. Bookmark the permalink.